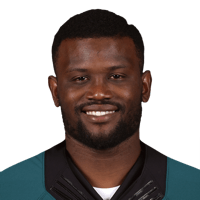 Published: Jan. 3, 2016 at 04:59 p.m.
Eagles safety Walter Thurmond takes a pick off Giants quarterback Eli Manning 83 yards for a touchdown. Published: Dec. 6, 2015 at 08:00 p.m.
Patriots Tom Brady is picked off by Eagles Malcolm Jenkins who returns it 100 yards for the touchdown. Published: Sept. 27, 2015 at 04:03 p.m. Published: Aug. 29, 2015 at 08:39 p.m.